Abdominal ultrasound is a painless procedure using sound waves to generate images of the abdominal internal organs and tissues. There is no ionizing radiation or intravenous dye. The organs identified and evaluated include: liver, gallbladder, biliary tree, pancreas, spleen, kidneys and abdominal aorta. 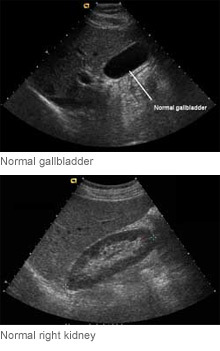 Abdominal ultrasound takes between 30-45 minutes. It involves laying down on a table and having warm gel placed on the abdomen while an ultrasound transducer is moved across the abdomen to generate images of the internal abdominal organs. Why do I have to fast for at least 4 hours before an abdominal ultrasound? What are the benefits of abdominal ultrasound? Abdominal aortic aneurysm (AAA) screening is a targeted ultrasound study of the upper abdomen using sound waves to look for abnormal dilatation or aneurysm of the abdominal aorta, which is the main artery in the body. Who should have abdominal aortic aneurysm (AAA) screening? Ultrasound gel is placed on the abdomen and images are generated using ultrasound, Doppler and color Doppler. What are the complications of abdominal aortic aneurysm (AAA)? 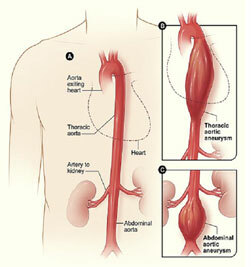 What are the symptoms of abdominal aortic aneurysm (AAA)?